L’Arbitre is back, this time discussing what the referees are wearing. I, Jenna, find this kit really attractive. The colours tend to look good on most of the referees, and the style and pattern of the kit is flattering as well. The red kit, particularly, seems to be universally flattering. Like this post? Visit L’Arbitre at Refereeing the Beautiful Game! Fashion, just like in Hollywood, is big in football. Have you noticed how vivid the colours are on TV when watching a World Cup game now relative to past tournaments? The uniforms look much better. You’ll notice referees outfitted in one of five colours; navy blue, yellow, red, baby blue and samba green. 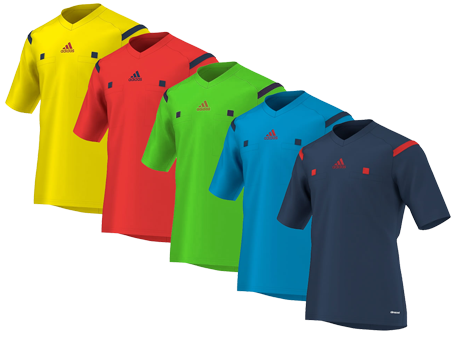 Adidas designs a new uniform for every edition of the World Cup and the referees for the tournament receive a set of kits free-of-charge from the adidas sponsors. Think of this but much larger and more extensive. Hard to imagine I know! The main themed colour is navy blue in this year’s edition; formerly black in 2010. The socks and shorts will be primarily featured in this navy blue. Learn more about the new referee kit. The uniforms, however, do not include a collar and have a V-shape neck. They follow the same pattern of the prior edition by including two breast pockets allowing more space for the referee to hold equipment; cards no doubt! The uniform is made up of mesh on the side and back including a navy blue line down the spine. This allows the air to flow through the uniform during natural movement for cooling. From my own experience, these uniforms are much more comfortable to wear. They are far lighter and this is no doubt designed for the hot and humid Brazilian weather. It was designed with adidas’ CLIMACOOL fabric and FORMOTION technology for muscle supports. The catalyst to this post was the Spain versus Netherlands game where both teams were outfitted in unorthodox colours. Check out this breakdown of FIFA’s regulations claiming why La Roja and Oranje couldn’t pick their trademark colours. Mind you, this had nothing to do with the referees. 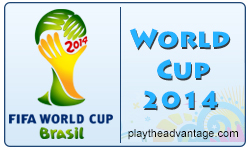 The Laws of the Game specify that there must be five distinct colours on the field of play. The referees are usually the last to determine their colour after inspecting the teams’ jersey, shorts and socks colours and determining their own team colour. For FIFA tournaments, there is an organising committee that determines all the colours to be worn by the five groups the day before the match so everything is clear and pre-determined to arrival at the stadium. By the way, don’t be surprised if you see referees in your local parks wearing these kits too because they are available for purchase to everyone! The blue jersey is actually neon in “real life”. In TV and on PC screens, it looks much more flat. I specially like the red one; but I must say it is hard to convince amateur coaches of having the right to wear the black jersey as the referee when asking them to change the black jerseys of their players…he will answer: “but you aren’t wearing black!”..
Btw keep up the good site! where can I purchase the three patches on the referees jerseys for world cup in Brazil 2014? Which three are you referring to Robert? The Fair Play, World Cup and another patch? The FIFA badge?